I'm writing this post in my camper bunk before I lay my head down for the night. It's really peaceful. Up until a few minutes ago, the blackbirds were singing, and I can just now hear a jet passing overhead on its way to some unknown destination.. It's one of those peaceful evenings you get after a long sunny evening, when the night air cools and eases the senses..
Today I had a timely accidental meeting with an old friend from my school days, Dave. 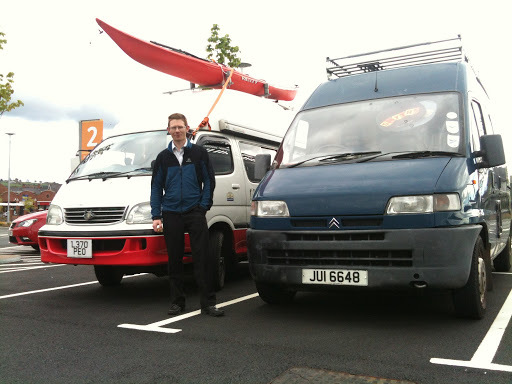 I pulled into a Tesco carpark and saw a converted van parked so I pulled up nearby, then suddenly as I was daydreaming about what to get to fill my fridge, there was a knock on the window - it was Dave and it turned out to be his camper van. Dave and I were good friends back in the BMX days in the mid eighties when every waking hour was spent riding and cleaning bikes, every weekend away at some race somewhere. Nowadays it turned out, Dave was a schoolteacher, happily married with two kids (one a recent arrival). Together with his wife, they were passionate travellers in their camper, and were also keen on climbing the 'Munros' - Scotland's peaks exceeding 3000 feet in height. It was great to see Dave at this time especially since he knows Scotland well and offered to give me a few ideas of places to visit on my journey. I also had an impromptu tour of the Citroen (I'm envious of his onboard shower! ), and that inspiration you get from meeting another camper vanner and checking out each others set-up. Take care Dave! 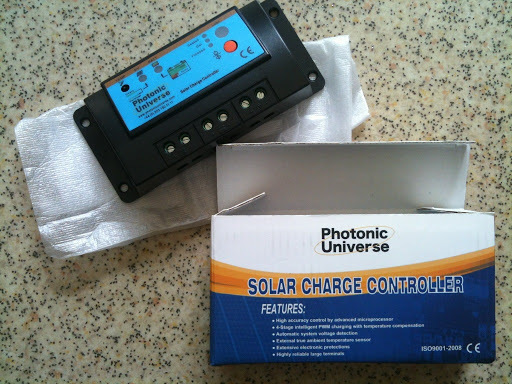 I also want to thank the guys over at Photonic Universe solar equipment for resolving an issue I was having so quickly, and in time for the trip. Check out my links page for their website details - they have solar set-ups for every mobile situation and need.